Molecular model of Bisphosphoglycerate mutase (BPGM), an enzyme unique to erythrocytes and placental cells that is responsible for the synthesis of 2,3-Bisphosphoglycerate. An enzyme is an protein that serves as a biochemical catalyst, encouraging chemical reactions, usually by speeding them up. Organisms could not function if they had no enzymes. Enzymes are composed of a globular protein chain, which is neatly and orderly situated, allowing only several specific amino acids to be bonded. It ranges in size from just 62 amino acids to over 2500 amino acids. The enzyme has a three dimensional shape which is constructed of several polypeptide chains being neatly twisted and folded to produce its unique figure. This shape is relatively larger than the substrates that bind and act with it. Only a small portion of the enzyme comes into contact with the substrate. The enzyme's rate of activity changes with the concentration of the substrate and with temperature. The enzyme has a high level of specificity, which can be described by the Lock and Key Hypothesis. This was first introduced by Emil Fischer, a German chemist, in 1894. His hypothesis states that a specific enzyme can only bond with one specific substrate. This means that only one enzyme will cause one specific reaction. This works because the enzyme is in a certain shape. This shape will allow only one single specific substrate to form a bond with the enzyme. The area where the substrate matches the enzyme is called the active site. The whole job of the enzyme is to perform a catalytic role. The enzyme speeds up the reaction of a substrate, causing the product to be formed. When the enzyme has completed this reaction, the substrate falls off as several different pieces as a product of the reaction. The enzyme itself, however, remains intact and waits for another substrate to bind with it to cause another reaction. The enzyme can carry on like this for a long period of time. The enzyme does not go out in “search” for a substrate; it basically waits for a substrate to collide with it before it can bond. Thus, the higher concentration of substrates, the more bonds will be made. This process can become tedious as only one specific substrate must bond with one specific enzyme. The substrate must be positioned in a specific manner that allows for it to fit right into the enzyme. The Induced Fit Model, introduced by Daniel Koshland in 1958, added an extra layer of complexity to the understanding of enzyme activity. In the new model, the binding of the substrate causes the active site to change shape, which puts the enzyme's amino acid residues in the right place to perform their functions. An enzyme is a highly specialized protein created in a cell. Their most important function in the body is to serve as a catalyst for chemical reactions; but they are also required for several other cellular functions. They are required for any muscle to contract, any cell to transport its contents, and for most forms of active transport. They are also important for many viruses to replicate. Enzymes are required for the replication of DNA, and blood coagulation. Enzymes are absolutely mandatory for any higher form of life to carry on its daily functions in an uneventful manner. Enzymes are very important in the process of digestion. Digestive enzymes are released as soon as one begins to chew his food. The enzyme amylase begins breaking down carbohydrates into simpler forms at this stage. Next, the food enters the stomach. It is then met with pepsin and protease. The enzymes begin digesting the food and breaking them down into simpler components so that absorption can occur in the small intestine. The small intestine also receives several different enzymes from the pancreas, and is the site where the vast majority of digestion occurs. RNA polymerase is an enzyme that catalyzes the polymerization of Ribonucleic acid during gene expression. Enzymes are also responsible for creating energy carriers, such as Adenosine triphosphate (ATP). This happens when a specific ATP Synthase enzyme bonds with a high energy molecule, containing one phosphate group. This phosphate group is coupled with an ADP molecule containing two phosphate groups. The enzyme catalyzes the reaction and soon the structures separate. The body is then left with an enzyme, a low energy molecule, and an ATP molecule. Most of this process occurs inside of the mitochondria, and the body uses the energy as soon as it is called upon. Another extremely important role of enzymes is DNA replication. This happens with a group of enzymes known as DNA polymerase. 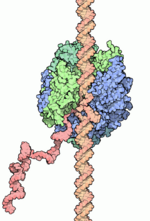 It basically extends an existing DNA strand, but can not create a new strand. A small strand of RNA (primer) binds with a template strand, then the polymerase reads the template and grows the chain by continuously adding more nucleotides. Finally, the polymerase initiates the end of replication, and the separate strands are then checked over to ensure they are free of errors. This point in the process is known as termination. The temperature in the enzyme's vicinity can also play a crucial role in its activity. Activity increases with temperature until a certain point, after which any additional increases in temperature will decrease the enzyme's activity. Generally, for each enzyme, there is a specific range of temperatures where the enzyme is active. For example, a shrimp that lives deep in the cold waters of Alaska will have enzymes that work optimally at a temperature of 4º C. Likewise, a bacteria that lives in the hot springs of Yellowstone National Park would have a temperature optimum of 95º C. It should be noted that as the temperature grows warmer, the acceptable range of temperatures also increases. So instead of having an optimum range of 4º-6º C, it swells to 25º-35ºC, and so on. This is true until about 40ºC. As the temperature rises beyond this point, an enzyme's range of active temperatures begins to decline, until eventually it is a very narrow range. The enzymes in the human body work best at around 35.7ºC. If one views a graph that indicates the optimal range for an enzyme, one will notice that this range is considerably broader around these temperatures. One could conclude from this that God designed the body in such a way that virtually no matter what temperature the human body is at, all of its enzymes are still working at an optimum rate. This is a fascinating feature that the body has been designed with and should be a testament to how intricate and specialized the human body has been formed by the Creator. Saturation of enzyme active sites with substrate. The concentration of the substrate also affects the rate of enzyme activity. The rate of reaction is assumed to not change as it progresses, so typically, only the initial rate is calculated. If the substrate concentration is low, then the rate increases very quickly with increasing substrate concentration. When the concentration of substrates gets closer to the concentration of enzymes, then the increase in rate slows down because the enzymes get close to saturation. Crystallographic structure of influenza A N9 neuraminidase and its complex with the inhibitor 2-deoxy 2,3-dehydro-N-acetyl neuraminic acid. Diagram of competitive enzyme inhibition. (a) Normal reaction, (b) Inhibition. S: substrate; E: enzyme; I: inhibitor; A: active site. (1) Enzyme binds substrate; (2) Enzyme releases products; (3) Enzyme binds inhibitor; (4) Inhibitor competes with substrate. 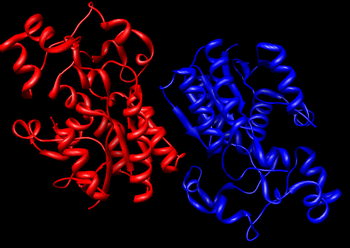 ↑ Structure and Function of an Enzyme Unknown Author, Microsoft, March 26, 2009. ↑ Energy and Enzymes Clinton Community College, November 12, 2008. ↑ Effect of temperature on enzyme activity Brooklyn College, November 27, 1997. This page was last modified on 20 June 2016, at 00:13.